CHARLOTTESVILLE, Va. (AP) — Virginia believes is has the players to be very dynamic on offense. All the Cavaliers need now is to get more players involved and find a better balance. 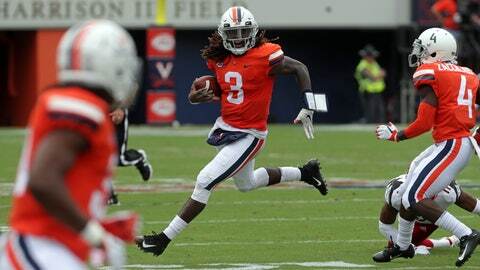 The three players viewed as Virginia’s Big Three — quarterback Bryce Perkins, wide receiver Olamide Zaccheaus and running back Jordon Ellis — have all played well at times. It hasn’t been enough. Other than wide receiver Hasise Dubois, none of the others players expected to be playmakers have come through. Virginia (3-2, 1-1 Atlantic Coast Conference) will look for someone to step up when it hosts No. 16 Miami (5-1, 2-0) on Saturday night. So far, when the balance has been there, and when it hasn’t, has been reflected on the scoreboard, coach Bronco Mendenhall said. In victories against Richmond , Ohio and Louisville , it was there. In losses to Indiana and N.C. State , it wasn’t. Zaccheaus leads the team with 33 receptions for 501 yards and six touchdowns, and Dubois had added 22 catches for 247 yards and two scores. The rest of the team: Thirty-three catches for 383 yards and three touchdowns. Ellis, meanwhile, leads the team with 478 rushing yards and six touchdowns, and Perkins, a dual-threat, is next with 341 yards and three scores, but the next most carries — seven — belong to backup quarterback Brennan Armstrong. Before the season, players like speedy wide receiver Joe Reed, sure-handed tight end and emerging playmaker Tavares Kelly seemed like the players most likely to benefit from the attention Perkins garners as a running threat and the ability of Zaccheaus and Ellis to make big plays, but the three of them haven’t been reliable. Perkins said he keeps talking to them, trying to bring them along. It will also take much of the stress off Perkins, whose ability to freeze defenses with the mere threat that he will pull the ball down and run has been compromised by teams loading the line of scrimmage to stop it. When the other players have a chance to make plays, Mendenhall said, they have to come through.